Electrons are negatively charged particles that are critical to the chemical reactions. Chemical reactions in living organisms, including humans, involve the movement and transfer of electrons. Indeed, the source of energy for life involves the transportation of electrons. Electrons can also play a role in the treatment of cancer. Radiation therapy involves generating and use of electrons to damage cancer cells. Unfortunately, electrons can cause unwanted damage and side effects during radiation therapy by initiating reactions in non-cancerous tissue. The side effects of radiation therapy can be reduced when electrons are controlled and captured by a material that traps them very quickly where and when needed. Fig. 1. When proper ionic liquids are selected to stabilize ionic liquids in a solution, the ionic liquids that are not chemically bound to the surface of the gold are in a dynamic equilibrium with the ones in solution. Therefore they can easily move out to make naked gold nanoparticles surface available to react with reactants very fast. The ionic liquid molecules on the surface of the nanoparticles in water don’t chemically bound to gold and are mobile so that when the electrons get close to the gold surface, the ionic liquids move away and the electrons could approach the naked gold nanoparticles. This way we made the fastest ever electron catcher in water created so far. 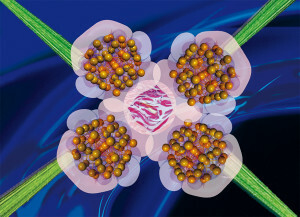 The combination of electron affinity and the size of the gold nanoparticles and their free surfaces makes this reaction extremely fast so much that the electrons cannot get trapped by surrounding water molecules. Our green gold can be used to shield the radiation that escapes to non-cancerous cells during radiation therapy. The material could also potentially be used immediately after nuclear attacks by capturing electrons made by radiation. Fig. 2. The “green gold” reacts extremely fast with electrons and potentially with other transients generated by radiation. If they would be placed in healthy tissues outside the area that radiation is supposed to make its damage to cancerous cells, they can mask the healthy tissues from damages made by the radiation. Moreover since these gold nanoparticles are made and stabilized using antimicrobial surfactants they can also prevent infection in surrounding tissues that are treated by radiation. Another potential application of green gold is the capture of electrons from the waste of nuclear reactors (or indeed from any radiation providing nuclear fuel) to be used in the generation of electricity. This application has the potential to change the future of nuclear energy. Nuclear energy could be transformed into electricity without the need for a turbine and with much less risk of radiation exposure. Can these green gold materials be used to react with other transient particles (for example, hydrogen (H) atoms)? This is an important question. Such reactive species can also cause radiation damage. Also the H atom plays an important role in chemistry. The standard model in chemistry is that all chemical reactions are driven by electromagnetic interactions within the quantum context. To test theories from such models, or to look at chemistry beyond the standard model, one needs to study the chemistry of the most fundamental chemical object, the H atom. To that end, we were the first group to study the reaction of H atom with metal nanoparticles via the surrogate of H atom, muonium (Mu). Mu is an exotic atom made from two elementary particles: an antimatter, the positive muon; and a matter, the electron. The difference of H and Mu is in their mass, Mu has 1/9th mass of H. To be able to study Mu reactions we had to use muon beams in a particle accelerator. For our studies we used TRIUMF in Canada. Ultra-fast electron capture by electrosterically-stabilized gold nanoparticles.